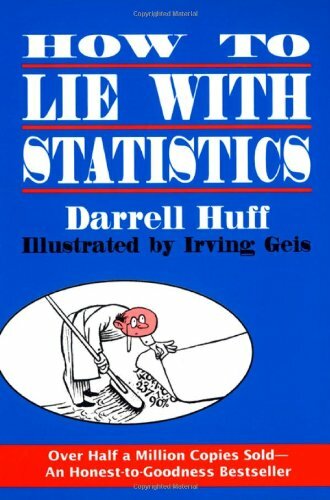 "There is terror in numbers," writes Darrell Huff in How to Lie withStatistics. And nowhere does this terror translate to blind acceptanceof authority more than in the slippery world of averages, correlations,graphs, and trends. Huff sought to break through "the daze that follows thecollision of statistics with the human mind" with this slim volume, firstpublished in 1954. The book remains relevant as a wake-up call for peopleunaccustomed to examining the endless flow of numbers pouring fromWall Street, Madison Avenue, and everywhere else someone has an axe togrind, a point to prove, or a product to sell. "The secret language ofstatistics, so appealing in a fact-minded culture, is employed tosensationalize, inflate, confuse, and oversimplify," warns Huff. Although many of the examples used in the book are charmingly dated, thecautions are timeless. Statistics are rife with opportunities for misuse,from "gee-whiz graphs" that add nonexistent drama to trends, to "results"detached from their method and meaning, to statistics' ultimatebugaboo--faulty cause-and-effect reasoning. Huff's tone is tolerant andamused, but no-nonsense. Like a lecturing father, he expects you to learn something useful from the book, and start applying it every day.Never be a sucker again, he cries! Even if you can't find a source of demonstrable bias,allow yourself some degree of skepticism about the results as long as thereis a possibility of bias somewhere. There always is. I got this book for a course in college back in the late 60's. I thought it was a great book then and I believe it is even more important today. We are bombarded with stats every day in every way. This little book helps cut through the lies and deceit that masquerade as fact today. Whether it's in a contracted poll or sifting through data supplied by the government, stats are used to lead us in one direction or another. Get this little gem and enjoy the old-fashioned graphics and the simple message. How to Lie With Statistics is a keeper. I lent my copy to a physician years ago and have regretted it ever since. He kept it and moved from the area. Argh. Or...How to not get fooled by statistics. I really enjoyed the book and I thought that the material was well presented and well researched. Darrell Huff seems to be exceedingly versed and extremely knowledgeable in statistics. Despite that, he does a great job at making the material easy to understand and follow without sounding condescending or delving into too much statistical jargon. The majority of material in the book deals with how statistics are sometimes used to deceive people and distort data for cynical purposes. Each chapter deals with a different method of how someone might mislead or fool others with statistics and with each method the author gives many examples and he thoroughly explains each one and how they are deceptive. Also, he uses some wonderful illustrations that demonstrate the different types of deceptive line and bar graphs. He uses these illustrations in order for the reader to better visualize exactly what he is trying to convey. The only downside to the book that I could think of, if you could even call it a downside, more like a drawback, is that it is rather outdated. A lot of his examples come from articles that were in some very highly regarded magazines at that time, and even now, such as Time, Harpers, Literary Digest, and Fortune. Even so, most of the examples are very old and difficult to completely put into perspective because they deal with things that are much different now then they were then. Nevertheless, the issues and subject matter presented in the book are still very relevant today as they were back then, seeing as some of the same deceptive statistics that are described in the book are still being used today, even among a few of the more reputable news media outlets on TV and in print. The last chapter is probably the most important because it gives the reader some worthy ammunition for recognizing and refuting questionable or suspicious statistical claims, i.e., the author goes back and tackles each topic in order to give the reader some tools to help spot and properly question statistics that are intentionally or inadvertently dubious. I highly recommend for everyone to read this book because it teaches an especially valuable lesson of why it is important to always be skeptical of statistical claims no matter where they come from. Maybe I expected too much from this book. I thought this book could give me more insight into the dangers of statistical interpretations or the wrongful use of statistics. This book didn't help me at all with that. It's all very (very) basic stuff people should watch out for, when using statistics. Most of this I already knew. I think for anybody who has already red a book from Nicholas Taleb (or anything alike) this book will not present any new material. 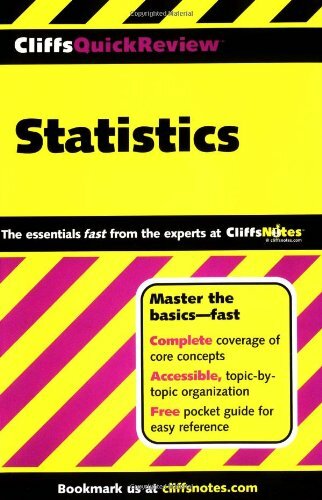 To people completely new to statistics, this book might be helpfull, but to those who frequently use statistics for their jobs or in their free time, this book won't add any value. There are much better books on statistics out there. Love this little book.I recommend it to anyone starting to study statistics, or to arm themselves as a citizen or a consumer.Fun, easy to read and very important.I first read it as a supplement to my college statistics class over 35 years ago and have read it at least a couple times since.It's timeless. I have just finish reading this book and, in my opinion, I thought that it is a very simple and funny whey to learn statistic. However, for people who intend to purchase something with more details about tests and analyses, I don't recommend this book. If you have ever looked for P-values by shopping at P mart, tried to watch the Bernoulli Trials on "People's Court," or think that the standard deviation is a criminal offense in six states, then you need The Cartoon Guide to Statistics to put you on the road to statistical literacy. I really am enjoying this book and it puts the humor factor into struggling through a Statistics class at a local university.I would recommend it for both the information and for the comic relief when Statistics gets just TOO stressful! I have to say that service was excellent...I received the book in just a few days after ordering it and it was in excellent, brand new condition. The content is of high quality and complex. This is not yet another statistics for dummies. If you have no background on statistics, you will be challenged reading this book. It doesn't water-down statistical concepts too much. 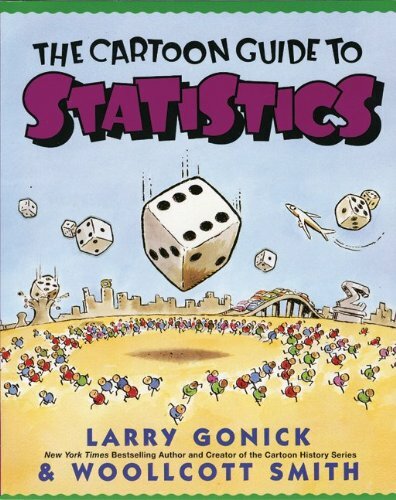 It gives the conceptual (as opposed to totally quantitative view) of statistics in a cartoon format with plenty of well-thought out examples (both real life and hypothetical). The downfall of this book, of course, is that it doesn't provide statistical practice problems and solutions. In my humble opinion, the best way to learn statistics, or any other quantitative subject, is through lot of practice and mental challenges. Although your conceptual understanding of statistics will be enhanced through this book, your actual applicable knowledge of statistics may still remain stagnant. This might be a good first book or even a good review of statistics. But certainly, this book is not adequate for those who want to learn statistics for application to real data. Still, this is immensely well contemplated book and I must congratulate the authors for creating a thought provoking statistics overview book without too many statistical equations and problems. I also enjoyed the cartoons and humor. 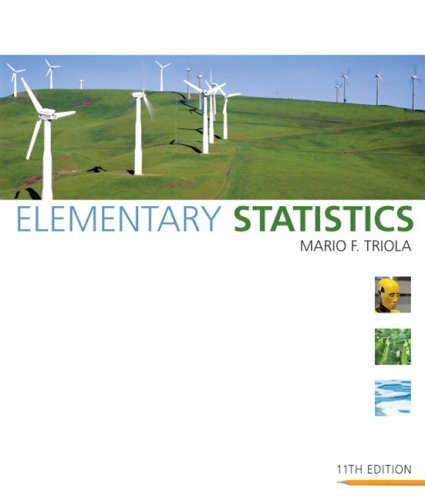 I wish I had known about this book, the first time, I took Statistics. This book is helpful because it puts the formulas and problems in a more layman type explanation. My last instructor had a degree in mechanical enigineering & statistics; therefore, she taught the class as if everyone was on her level of knowledge with this crazy math!!! I love this book!! It is worth the money!! This book was listed as an optional textbook for an introductory statistics class, placing it on a shelf in the campus bookstore next to a book I needed to buy.My eye was attracted by the cartoon cover and, after a quick scan, I decided to buy it.It was worth it. Larry Gonick and Woollcott Smith cover the same content as many introductory statistics books.The eleven core chapters cover basic statistical concepts, the nature of data, and the essentials of probability, random variables, distributions, sampling, confidence intervals, hypothesis testing, comparing samples, designing experiments and regression.It is a lot of material that flows quickly.The final chapter introduces "a biased sample" of advanced statistical techniques.A bibliography--reasonably up-to-date when the book was published--points the reader on to further learning about statistics. The book's title gives the fun part away.The authors use the panel-by-panel presentation style and humorous asides of cartoons as their primary mode of presentation.This works surprisingly well.It makes readers--particularly those intimidated by statistics--comfortable and ready to just read the panels.An instructionally useful side effect is the repeated use of graphical rather than textual definitions of statistical concepts.The tongue-in-cheek humor reinforces the relaxing experience of reading cartoons and eases the learning experience. I have never required this book as a text for a statistics class.But I have listed it as an optional text and I have loaned it to a student or two.It is good therapy for those afraid of their first statistics class.And it's a fun read for those who have already passed this hurdle. I found this book great review for the topics covered on the AP exam. After going through the textbook chapter, i would usually read the Barrons to reinforce it.But I must admit that the Barrons summary of the topics are a little brief, and might be confusing if you do not know what they are talking about. I would not recommend solely reading Barrons, but rather reading your textbook (or possibly 5 Steps to a 5) to understand the topic first before going to Barrons. Barrons always adds more in depth explanations and key points that may have not been included in the textbook. As for the practice questions, they are really well written. Though they seem hard, and are actually harder than the ones on the official exam, they prepare you well. If you can answer these questions, you are going to ace the real ones. I would highly recommend this book (along with your textbook) to prepare for the exam. 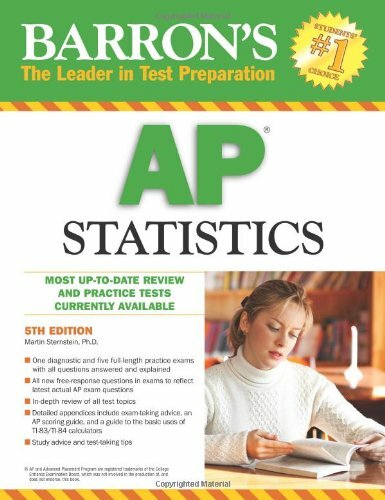 AP Statistics older version, but that is what the teacher wants, so it's perfect, good price and easy to order. If you want your students to earn college credit for AP Statistics - use this book! Dr. Martin Sternstein has outdone himself again.With each new edition, this fabulous review book includes more topics, better explanations, more practice problems based on recent AP exams, improved rubrics, and better technology.This review book is far and away the best on the market.Professor Sternstein is a true master teacher.I use this review book religiously both throughout the school year as well as at test prep time.My students have been running a 90% pass rate on the AP Statistics exam - which compares nicely to the national 60% pass rate.Use this book - you won't regret it.Teacher Tip:Use this book in conjunction with Dr. Sternsteins flashcards - the kids love them! Order the SPSS Student Version (ISBN: 978-1-4129-7960-3) of this text and your students will be able to practice SPSS (version 18.0) on their laptops in the convenience of their dorm rooms (rather than in the computer labs) for just $25 more than the text alone. 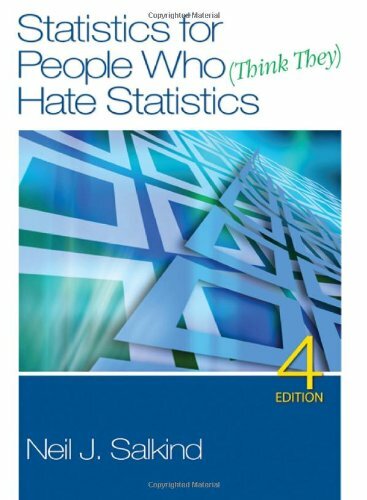 The bestselling Statistics for People Who (Think They) Hate Statistics is now in its Fourth Edition! This text teaches an often intimidating and difficult subject in a way that is informative, personable, and clear. Author Neil J. Salkind takes students through various statistical procedures, beginning with correlation and graphical representation of data and ending with inferential techniques and analysis of variance. In addition, the text covers SPSS, and includes reviews of more advanced techniques, such as reliability, validity, introductory non-parametric statistics, and more. Pedagogical features include sidebars offering additional technical information about the topics presented and points that reinforce major themes in the book. Finally, this new edition includes more examples than ever before, an expanded set of exercises at the end of each chapter, and a more comprehensive glossary. I love the services Amazon.com offers. So far, I've counted on Amazon.com to direct me to the lowest prices and best service providers. Haven't been disappointed yet. This is an excellent book for the beginner statistic student.It is very well written and the author uses humor as much as possible. This book is exactly what I need for my Designing and Interpreting Education Research Class. So far, this book has been very easy to read in terms of continuity. Flows well and keeps me focused. Worth buying for your stats class. In the numbers explosion all around us in our modern-day dealings, the buzzword is data, as in, “Do you have any data to support your claim?” “The data supported the original hypothesis that . . .” and “The data bear this out. . . .” But the field of statistics is not just about data. Statistics is the entire process involved in gathering evidence to answer questions about the world, in cases where that evidence happens to be numerical data. Practical and intuitive explanations of statistical concepts, ideas, techniques, formulas, and calculations. Clear and concise step-by-step procedures that intuitively explain how to work through statistics problems. 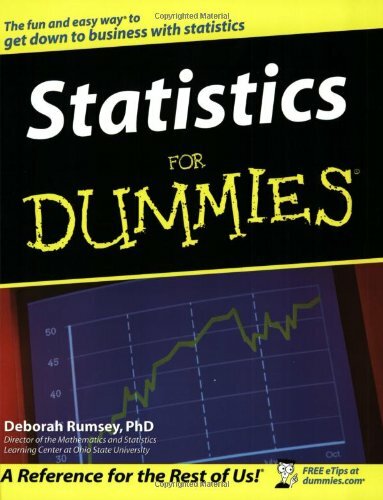 "Statistics for Dummies" by Deborah Rumsey is an Exceptional book! I completed statistics at both the undergraduate and graduate level and did not enjoy the courses! This book completely changed my attitude about statistics for the better! The book is well written and is logically broken down with each chapter focusing on specific statistical subjects! One thing I like about the book is that each chapter can stand on it's own. 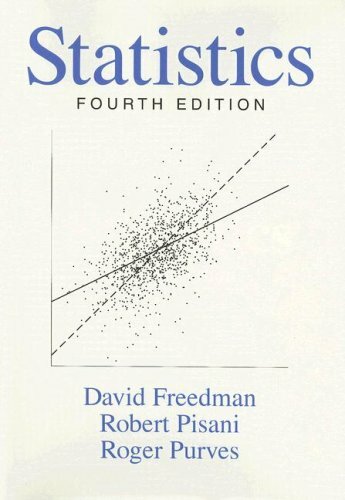 This book would be great to help prepare a student for an upcoming statistics course and is certainly better written than most college statistics textbooks I have seen. 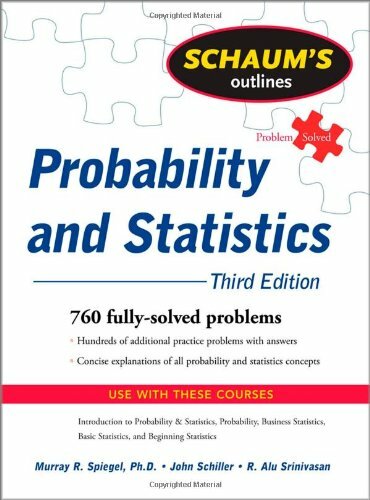 In fact, it might be a good idea if college/university statistics professors made this book a mandatory companion to the textbook they already use. 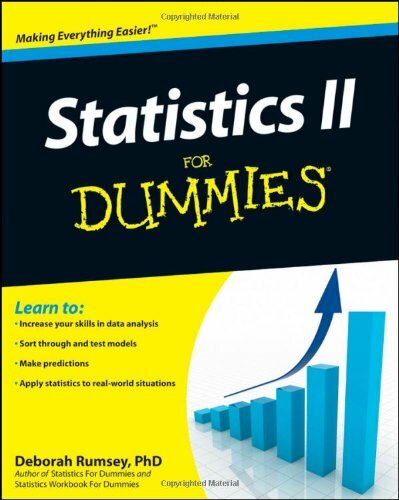 Of course if any reader of this book feels the subject matter is not advanced enough, they may also purchase "Statistics 2 for Dummies" by the same author. Finally, the book was actually fun to read with much more "personality" than other books covering roughly the same subject matter. This book is generally an easy read and that may be its biggest plus. It is not so hard to read compared to other books on statistics. However, the book is too focused on polls instead of giving a general overview of the subject of statistics. On top of that it is not very well structured. It seems the sequence of the chapters is a bit random. The book does not flow in a logical and clear sequence. Breaks down the concepts of statistical usage as well as the techniques to develop statistical records that can be interpreted by lay persons as well as those with statistical backgrounds. 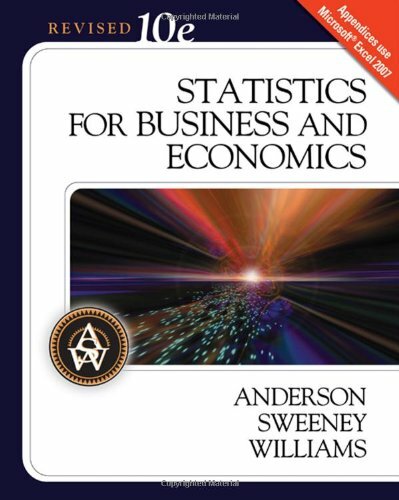 This inexpensive paperback provides a brief, simple overview of statistics to help readers gain a better understanding of how statistics work and how to interpret them correctly. Each chapter describes a different statistical technique, ranging from basic concepts like central tendency and describing distributions to more advanced concepts such as t tests, regression, repeated measures ANOVA, and factor analysis. Each chapter begins with a short description of the statistic and when it should be used. This is followed by a more in-depth explanation of how the statistic works. Finally, each chapter ends with an example of the statistic in use, and a sample of how the results of analyses using the statistic might be written up for publication. A glossary of statistical terms and symbols is also included. A new chapter on Factor and Reliability Analysis especially helpful to those who do and/or read survey research. New "Writing it Up" sections demonstrate how to write about and interpret statistics seen in books and journals. A website at http://www.psypress.com/statistics-in-plain-english with PowerPoint presentations, interactive problems (including an overview of the problem's solution for Instructors) with an IBM SPSS dataset for practice, videos of the author demonstrating how to calculate and interpret most of the statistics in the book, links to useful websites, and an author blog. New section on understanding the distribution of data (ch. 1) to help readers understand how to use and interpret graphs. Many more examples, tables, and charts to help students visualize key concepts. Statistics in Plain English, 3rd Edition is an ideal supplement for statistics, research methods, and/or for courses that use statistics taught at the undergraduate or graduate level, or as a reference tool for anyone interested in refreshing their memory about key statistical concepts. The research examples are from psychology, education, and other social and behavioral sciences. - There are numerous mistakes in formulas and calculations that lead to frustration (page 51, 72, ...). When you see something later that you do not understand, you are not sure if it is because the author didn't proof read his own document or because you are misunderstanding something. This leads to a lot of wasted time trying to understand something that turns out to be a mistake. - In his attempts to explain "effect size" he uses an example in which "we probably would not actually want to calculate and effect size"
- He explains a lot how to do things but not much about why they are done that way. Basically, for me, this books selling point was its title. I found it to be a waste of time and recommend starting with one of the many better books out there with the same idea. I have not worked through the whole book yet, but the chapters that I have read are clear and very easy to understand. The glossary of terms at the end of each chapter is excellent. Definitions provided by my lecturer often make little sense to me, but in this book, it is truly in plain English. This book increases my confidence in my ability to work with statistics. The Kindle edition obviously does not come with the CD, but I found that the CD is available for free download online (legally, from the publisher's website). The CD contains interactive problems and PowerPoint presentations of each chapter, so it is a good companion to the book. I passed my statistics course, thanks to this book.The Kindle edition contains several errors, clearly made during the electronic conversion process.For example, some characters weren't converted correctly, so that it becomes difficult to distinguish between + (addition) and ÷ (division) symbols.These types of errors mostly occur in the example equations.When they didn't make sense, I read the text again to figure out what the examples were supposed to look like.Despite such minor glitches, the book was very helpful, particularly so for being a searchable Kindle ebook. It is the best book I could have ever bought. I am feeling a lot more confident with statistics. I sometimes wonder if I'm dumb or if books are poorly written.Well at least in statistics, I believe that it's the way textbooks are written.This book is extremely well-written.A few trivial typos here and there, but overall the guy has a knack for explaining the big picture.These days with computer-based stats packages, knowing how to calculate each value is great, but interpretation is what most of us will be doing.I feel much more confident about statistics after having read this book. Not a numbers person? No problem! This new edition is aimed at high school and college students who need to take statistics to fulfill a degree requirement and follows a standard statistics curriculum. Readers will find information on frequency distributions; mean, median, and mode; range, variance, and standard deviation; probability; and more. I had no problems with this order. It came in a timely manner and it was in great shape -- as promised. Good primer for college-level statistics courses. I've been good at math my whole life. Of all the math disciplines, however, statistics is the one that has taken me the longest to grasp. The many concepts and formulas are not stored in memory overnight, and can often seem discouraging. Hence, I strongly recommend reading The Complete Idiot's Guide to Statistics as either a primer, or as a supplement, to the statistics textbook for your class. For one thing, the price is much cheaper than a textbook. The informal writing style, laced with humorous personal examples by the author throughout the book, makes this introduction to statistics much more digestible than a college textbook. I spent five days reading this book from cover to cover, because I needed a crash course. I was able to do this because this book is concise compared to a college textbook. Before you begin reading this book, make sure to download the errata page available on the book's website. After doing this, I still noticed several minor mistakes printing errors scattered throughout the book. However, I was able to pencil in the revisions myself. I just didn't feel like e-mailing them in to the author at the book's website. Very imformative book.Well written and easy to understand.Explains the topics very well. 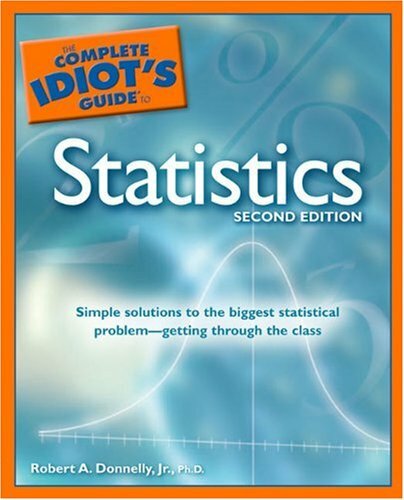 Though I do not think I am an idiot, this book came in handy when looking at and using stats. Product came in a timely manner but I wasn't expecting all the 'used' stickers decorating it. 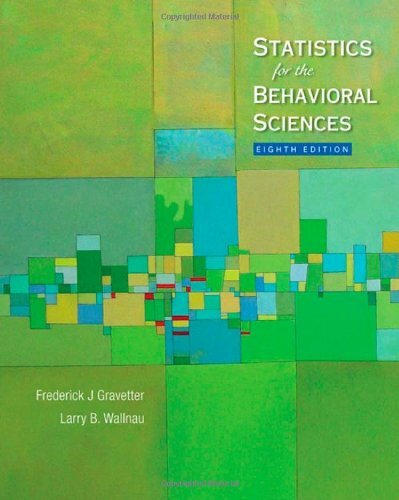 This is a popular and required text for most Statistics courses.It's a decent read, and as textbooks go, it's pretty good.Although I had an older edition of this book, I was required to purchase the newer (and costlier) edition for my independent-study course, so that my text would correspond to the instructor's. While this was just a nuisance for me, the whole billion-dollar textbook racket is just that -- a racket.It is making a needless dent in parents' pocketbooks and down the line will probably result in spinal-column and back problems for the masses of students who have to lug around these needlessly hefty and expensive books. As a h.s. science teacher, I've reviewed new editions of textbooks and compared them to the older editions.What I have found:Often, there is a tiny bit of new info in the newer texts, a few new problems, and a new "appearance".One major publisher took the older version,juggled around and renumbered the problems at the end of the chapter, switched a few sections from the main part of the text with sections in the Appendix, put on a different cover, reformatted some pics,... and voila' ... a new edition.It's always bigger and weighs more than the older edition, so the price is more.The old storyline that the pretty glossy pictures will engage the students is pure baloney!! My old college chem book from the 70's (UMASS) sold for $10 new, $2.70 used.No glossy pics, but all the info was there and it's half the size and weight of current h.s. texts. A few years ago, a Japanese foreign exchange student showed me her h.s. chem book from Japan: All the topics were explained, plenty of practice probs, and the book was softcover about 6" x 9" and about 1/2" thick. As I see some poor freshmen (esp. the girls) struggling to walk with these heavy books on their backs, I wonder --why are parents not outraged? Did not care for this statistics book - felt I had to do online research to supplement it. Not clearly written and not all inclusive. This book is straightforward. The examples clearly demonstrate the concepts, formulas, and definitions. I'm using this book for self guided study in order to pass a statistics competency test. I feel confident after going through this text. When it comes to pinpointing the stuff you really need to know, nobody does it better than CliffsNotes. This fast, effective tutorial helps you master core statistical concepts -- from numerical measures, probability, and sampling to principles of testing, univariate inferential tests, and bivariate relationships -- and get the best possible grade. Nice summary of statistics before taking on a course in the subject. This book provides a nice summary of statistics, prior to engaging in actual coursework. After reading it and completing all of the practice problems, it serves as a handy reference to supplement your textbook and homework problems. Personally, I've re-read it several times, since the knowledge isn't retained overnight. Whenever I'm rusty on a particular topic, I'll re-read that chapter. While finishing the guide is a good place to begin a study of statistics, you need to continue on to other, more comprehensive sources next. After completing this book, I next read The Complete Idiot's Guide to Statistics, 2nd Edition, which took my understanding to the next level. Now my college textbook makes so much more sense to me, and is easier to digest. This CliffsQuickReview of Statistics is limited in scope, especially with more advanced topics. It does touch a bit on correlation, linear regression, and chi-square testing. However, it doesn't get into topics such as goodness of fit, analysis of variance (ANOVA), and the F distribution. I received the book in perfect condition and extremely promptly.An excellent transaction!Thank you! I purchased this book as a refresher for a course I have to take towards my MBA degree.It is very easy to use and the concepts are explained in a way that makes it easy to understand. Going back to school as an adult is sometimes a challenge. This one, just alike all the cliff note series, is great for a quick cold review of a subject that was studied quite a while ago. 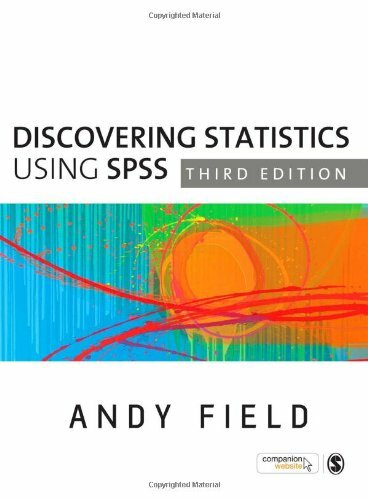 Andy Field’s self-deprecating, vivacious but yet easy to understand writing style has won him many plaudits, and now an award from the British Psychological Society (2007), for his irreplaceable Discovering Statistics Using SPSS. 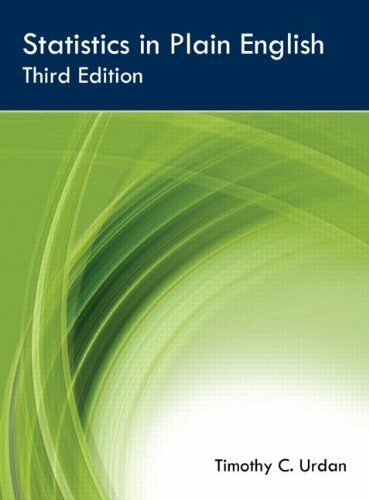 The Third Edition is now even more accessible to the introductory student at the very beginning of their statistical journey. The textbook now uniquely walks students from very basic to advanced level concepts, all the while grounding knowledge though the use of SPSS. Accompanied by an improved Companion Web site at www.sagepub.co.uk/field3e including animated “SPSS walk-throughs” of tests discussed in the textbook; assessment materials and datasets pertinent to lecturers/instructors in Business & Management and Health Sciences; and a suite of other materials for lecturers/instructors and students as per the 2nd Edition. The original CD-Rom materials are now found on this Web site as well. The company sent me the wrong item and wouldn't refund my money. Correspondence with the company ended after the 1st email. They responded to my first sent email but nothing followed. I mentioned that I've bought books from them in the past, so it doesn't seem like they really care about their customers but rather just their money. Sounds like a good deal, right? I am a big fan of conversational writing style, but literally 20% or more of this book is simply the author trying to have a cute conversation.The book is written as if the audience was composed of nothing but children.Furthermore in the very first chapter the author mis defines the word 'theory'.A theory is not a guess, it is not an hypothesis. It is a model based on many facts. Beyond that problem, an alarmingly large portion of this book is just the author rambling on with anecdotes he thinks are funny.All those anecdotes do is distract one from the statistics.I would think he could cull about 200 pages of needless drivel, and make a much more effective book. Look no further--this book has it all! Most stats and SPSS books are incomplete and/or difficult to understand, as if the authors are the keepers of this mysterious knowledge, and it can only be shared in the classroom.This book, however, has everything.The FULL explanation of every type of analysis, what all of the terms mean, step-by-step instructions in SPSS RE: how to run the analysis, with pictures of the windows in SPSS, plus pictures of every output box and a clear explanation of what's in the output.FINALLY!Plus, it's actually a pretty engaging read, with some humor and personal stories to keep your interest.For all that you get, it's an excellent value; high recommended! This was a useful tool for me as I am an older student and needed more input. For algebra-based Introductory Statistics courses. 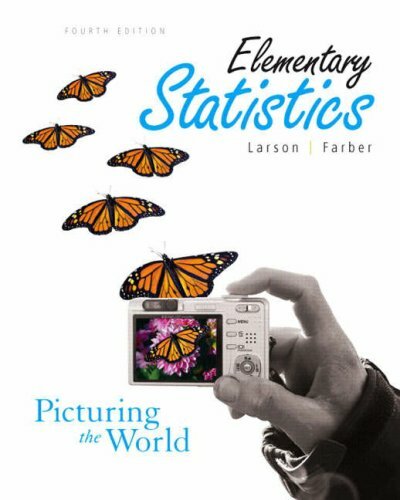 Offering the most accessible approach to statistics, with a strong visual/graphical emphasis, this book offers a vast number of examples on the premise that students learn best by "doing". The fourth edition features many updates and revisions that place increased emphasis on interpretation of results and critical thinking in addition to calculations. This emphasis on "statistical literacy" is reflective of the GAISE recommendations. The product arrived a few days later than expected but in good condition and as promised! Gweedo8 was very easy to work with and a very honest dealer.We are very happy with the product and the service we received.Thank you! the book came in great condition with basically no markings in it.exactly what i needed for my psych methods class.i'm sure in anyone in a psych methods class or psych statistics would find it useful. I am so happy with my book!It came to my doorstep lickety split, and it is in great condition!For the price I paid, there are no markings, writings, or dog ears on it at all.I cant believe it!Thanks a bunch! Can anyone fix the Typo's? The book has some great examples and are easy to understand.My only problem is the typographical errors.They are way too numerous for the cost of the book.Somebody fire the editors and/or proofreaders that let these get by.They have taken a subject that many people are phobic about and struggle with and have made it more confusing by the mistakes that are in the book.Two errors in one problem...Somebody help me please!Professors, please pick a different book or at least read through the one you are selecting to make sure the editing was actually done! The book is full of information but lacks cohesion when you do the homework reviews and cases. There is a big difference in what is shown in the book and what is expected. I find that each chapter is lengthy and full of information and definitions. I would much rather know what the functions are than how each came about. I bet there are better books out there to learn to design web pages. 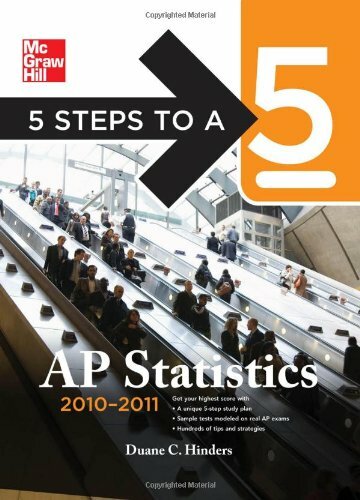 This book and the way it's advertised make it seem like an idiot's guide to Stats. However, it's not. It's actually pretty dense for that. It is a great supplement to a Stats class. It cuts through a lot of the nonsense and verbiage of many stats texts. I'd suggest using this to supplement the class (after lectures etc). It's also great to refresh yourself on basic stats and probability concepts once you've taken a course. I just wish it had more diagrams and pictures of the various distributions. I thought the material covered in this book was excellent and the examples are very good as well, but there was just one problem....riddled with typos.I noticed the first one on a Supplementary Problem in the the first chapter: the given answer was way off. Then in the 2nd chapter I noticed on another practice problem that there was an addition sign instead of an equal sign.Issues like this popped up for me through the FIRST 5 CHAPTERS!!!! If you are just learning some of this material it can be extremely frustrating because one symbol or number that is off may cause you to rack your brain for hours trying to figure out if it's the book or you that is wrong. Because most students blindly trust books this can cause a real hiccup in your studies.When I finally got fed up with the book I had to call McGraw Hill to see if they could exchange it for one without all the errors. Because I didn't purchase it directly from them (as most individual students purchase books from a store) they said there is nothing they could do for me except inform the editors.When I asked them if they accept any product liability on their part their response was: "If you buy food from one grocery store you can't return it at another". I urge you that if you are learning this material for the first time STAY AWAY FROM THIS BOOK.I gave this book 2 Stars because the content and explanations were pretty good, but the typos eventually became too much to overlook. Probability and Statistics is my life. I needed this book to just refresh my basic stats and this is it. I have been out of school nearly 20 years, and these books bring back all what was locked away, great books for anyone wanting to expand their knowledge. Highly recomend buying the combo's though, Statistics For Dummies and also the workbook combos, its cheeper, and better studying. Workbook has offers easily understood exercises to reinforce your understanding of elementary statistics and statistical usage. Used this in a graduate Statistics course to help with ideas.Worked for me. 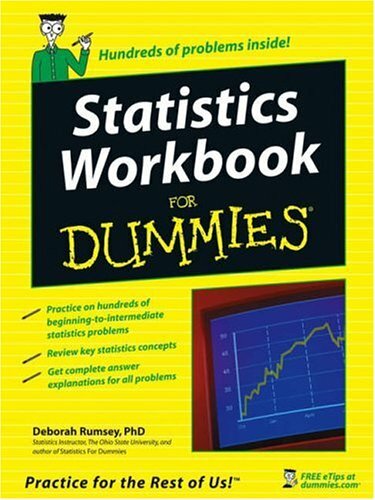 I am currently using both Statistics for Dummies and Statistics Workbook for Dummies. The books are step-by-step books for people who have no knowledge of statistics and learning the concepts of statistics.I am currently in a statistics online college class at the age of 45+, and I am finally comfortable learning statistics on my own. I am also using Algebra for Dummies; this book is also very good. I would recommend these books to any college student. The Basic Practice of Statistics has become a bestselling textbook by focusing on how statistics are gathered, analyzed, and applied to real problems and situations—and by confronting student anxieties about the course’s relevance and difficulties head on. 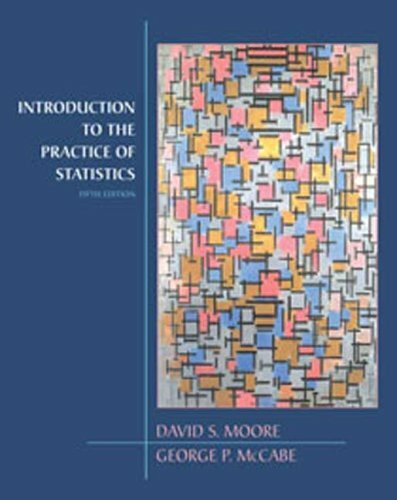 With David Moore’s pioneering "data analysis" approach (emphasizing statistical thinking over computation), engaging narrative and case studies, current problems and exercises, and an accessible level of mathematics, there is no more effective textbook for showing students what working statisticians do and what accurate interpretations of data can reveal about the world we live in. In the new edition, you will once again see how everything fits together. As always, Moore’s text offers balanced content, beginning with data analysis, then covering probability and inference in the context of statistics as a whole. It provides a wealth of opportunities for students to work with data from a wide range of disciplines and real-world settings, emphasizing the big ideas of statistics in the context of learning specific skills used by professional statisticians. Thoroughly updated throughout, the new edition offers new content, features, cases, data sources, and exercises, plus new media support for instructors and students—including the latest version of the widely-adopted StatsPortal. The full picture of the contemporary practice of statistics has never been so captivatingly presented to an uninitiated audience. I was pleased with the amount of time it took to receive my book. It was also in pretty good condition. I was very pleased. Thanks! This product was great, it was exactly as described in the description. I prefer hardbound books over paperback, which was why I was buying it in the first place. The shipper was fast (about a week, I live on the West Coast) and I would do business with them again. Good quality and shipped fast. Other than that I have nothing to say as I have yet use it. The book with the CD was in great condition, and arrived in a timely manner. I was very pleased with my purchase. With its focus on data analysis, statistical reasoning, and the way statisticians actually work, Introduction to the Practice of Statistics (IPS) helped bring the power of critical thinking and practical applications to today's statistics classroom. Unlike more traditional Â"plug and chugÂ" /formula driven texts, IPS de-emphasizes probability and gives students a deeper understanding of statistics. 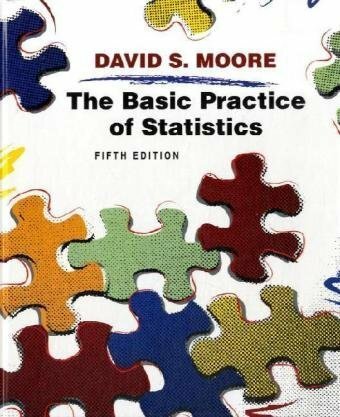 Moore and McCabe's Introduction to the Practice of Statistics is very helpful.It gives a great overview of the topics and explains the principles well.The exercises solidify the concepts taught in each section. The book cam in amazingly fast and it was as described and it was at a good price for me. It was about $8-$9 and that was WITH shipping and handling. It also came with the CD ROM which I have not used as of yet. I just started classes and have not really used the book. I've just gone through a couple of pages and everything seems perfectly fine. Very satisfied with the seller. Quick shipping initially, but when I had to return the book, a full refund was awarded without difficulty at all. Item was received in a timely fashion, and was exactly as described on the website. The price was very reasonable, and the textbook is in excellent condition. Thank you very much for a seamless exchange. Will do business in the future. Thanks! I liked this book.Its very easy to read, and covers everything you need to know about basic stats.